This classic diamond solitaire ring from The Forever Diamond is set on a gently tapered palladium ring, the 950 hallmark indicates its 95% purity. This palladium is a naturally white, tarnish resistant and hypoallergenic metal. Finished with a 'Forever' engraving and a hidden diamond on the inside of the band, this ring offers timeless elegance with a total diamond weight of 2/3 carat. 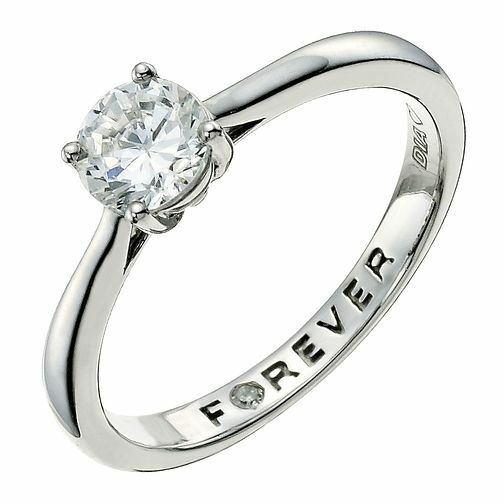 Palladium 950 2/3 Carat Forever Diamond Ring is rated 5.0 out of 5 by 1. Rated 5 out of 5 by Anonymous from Absolutely stunning. Quite beautiful, fits nicely, and looks marvelous.